The Days of Johann, an agility dog! 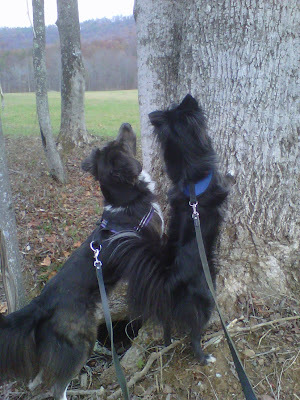 : Can dogs climb trees? Can dogs climb trees? Well that depends on how much they want the squirrel, BOL!!! There we were...minding our own business on our walk through the pasture the other morning. Mum is always keeping an eye out for critters...snakes, deer, skunks, stray dogs; well, you get the idea. We were walking by the creek, when Mum spotted a squirrel playing around the trees near the creek. She didn't tell us about it, 'cause, well, we get kinda wacky when we see squirrels and she didn't want to loose all the ligaments in her shoulders. Just then, when it was about four feet from us, I saw it!!! Little squirrel-y thing needed an anti aging product that works, I tell ya! I pulled Mum right up to the tree and started to try and climb it. Got about four feet up the tree and wouldn't you know I was within a couple of feet of that squirrel climbing up the tree! Who knew dogs could climb trees? But now I know I can, at least a little, BOL!